- First Passage to the West on the Rocky Mountaineer, as featured on 'Great Canadian Railways' with Michael Portillo. 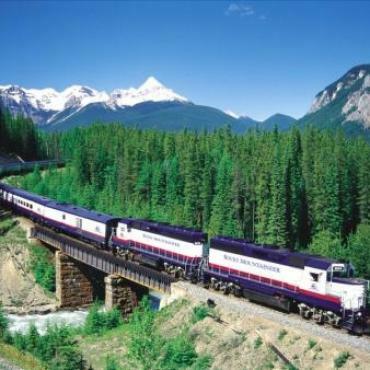 First Passage to the West is the most popular of the Rocky Mountaineer routes, and the only passenger rail service on the historic Canadian Pacific track - famous for uniting the country and connecting British Columbia to Canada over 125 years ago. 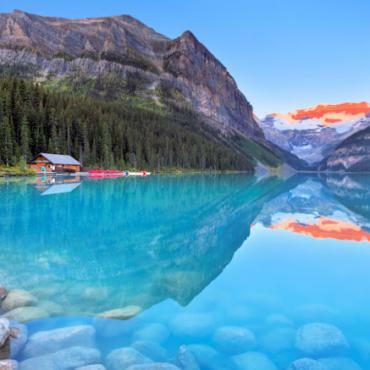 To many, Banff and Lake Louise represent the holy grail of must-see sites in Western Canada. When you embark on this 7-day escorted rail/tour of a lifetime and you'll experience luxury, romance and incredible scenery as your journey through some of the most spectacular scenery on earth. 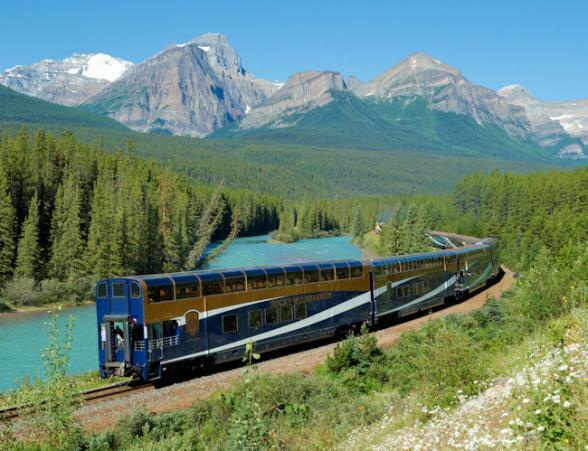 The Rocky Mountaineer's Passage to the West was recently featured on Michael Portillo's BBC2 series, 'Great Canadian Railways'. This journey can be taken as an escorted rail/tour holiday, or a part of a fly-drive. Pre/post Alaskan cruise add-ons are also available. All Bon Voyage holidays can be totally tailor-made, please call for further details. This tour also operates in reverse. Dates available from April to October. Silverleaf and GoldLeaf service are available. All Bon Voyage holidays can be tailor-made and the 2-day rail trip can also be combined with a fly drive holiday and/or Alaskan cruise. Please call Bon Voyage for a full itinerary planning service, current availability, prices and special offers. 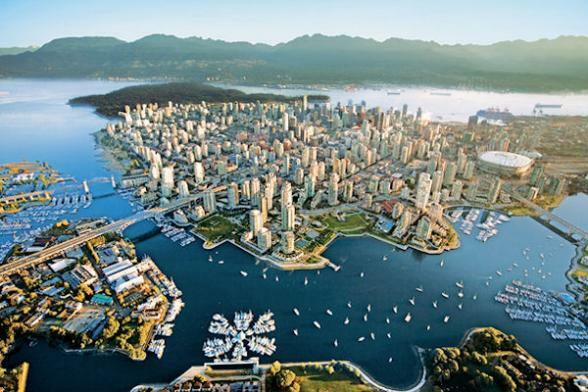 Nestled in an idyllic setting between the Pacific Ocean and the North Shore Mountain range, the cosmopolitan city of Vancouver is a coastal gem. Spend your evening here exploring historic Gastown or enjoy the views over the Straits of Georgia as you dine by the waterfront. 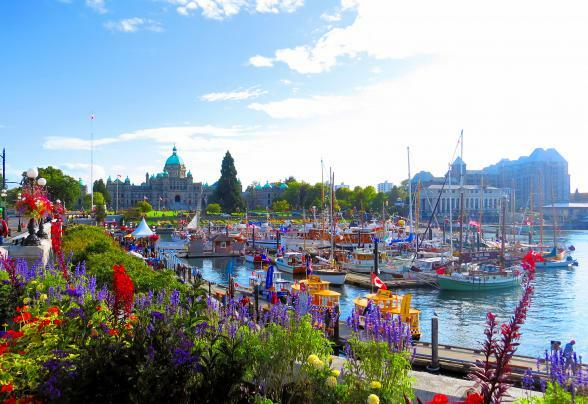 Want to spend longer in Vancouver, or time on Vancouver Island? Maybe an Alaska cruise takes your fancy? All these options, and others can be added to your holiday. Please can Bon Voyage for further details. 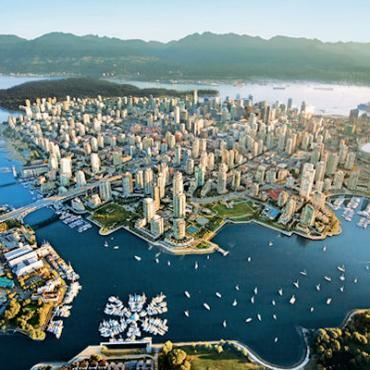 Today, you'll enjoy a tour of Vancouver plus a choice of activity. 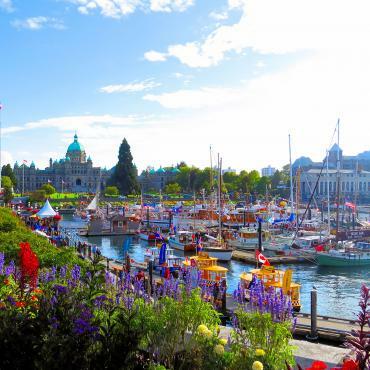 These include, a Sea Safari along the Howe Sound coat, culinary walking tour of Granville Island, guided cycle tour and a sightseeing tour of Vancouver's stunning North Shore. All aboard the Rocky Mountaineer! You'll be collected from your hotel for a 7.30am departure. Once onboard you'll enjoy a delicious breakfast. Today you'll travel in comfort and style from the Pacific Coast city of Vancouver to Kamloops, in the heart of British Columbia’s interior. 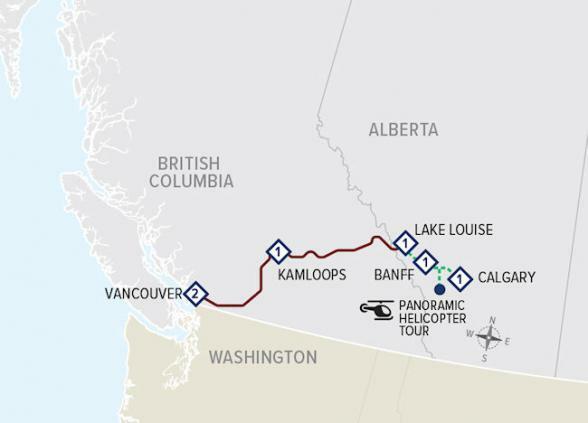 On your journey you'll witness dramatic changes in scenery, from the lush green fields of the Fraser Valley, through forests and winding river canyons surrounded by the peaks of the Coast and Cascade Mountains, to the desert-like environment of the BC Interior. 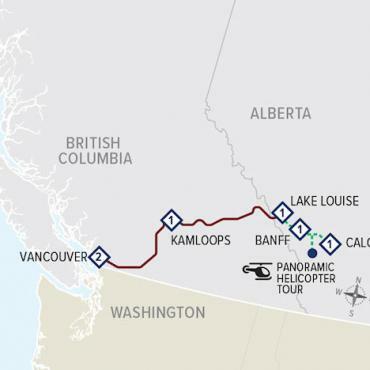 Highlights today will include the cascading waters of Hell’s Gate in the Fraser Canyon and the steep slopes and rock sheds along the Thompson River. Lunch, wine and beverages will be served onboard as you make your way through Western Canada's most spectacular scenery. Your day concludes along the shores of Kamloops Lake between 6:00pm and 7:30pm. In the evening take a stroll around Kamloops, enjoy live music in one of the bars, or relax with a coffee in the pretty waterfront park. It's an early morning 6.25 am departure today, but it will be worth it. Just when you think the scenery can't get any better. It does. 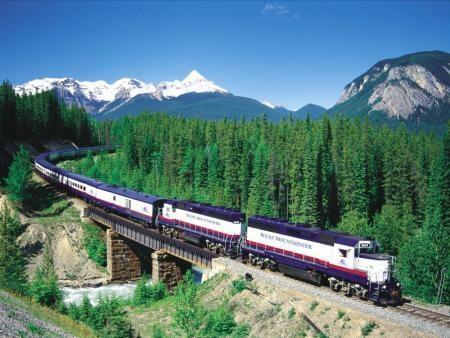 Your journey today takes you east to the mighty Canadian Rockies and the province of Alberta. 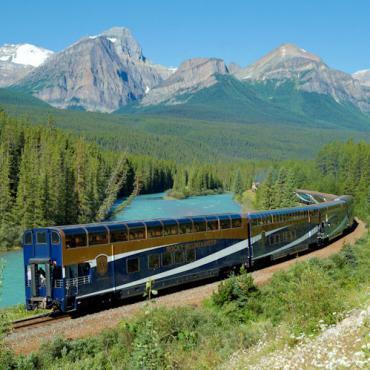 Gaze out over ranchlands, turquiose lakes and high mountain passes before we travel through the remarkable tunnels that form part of the rich rail history of the Canadian Rockies. 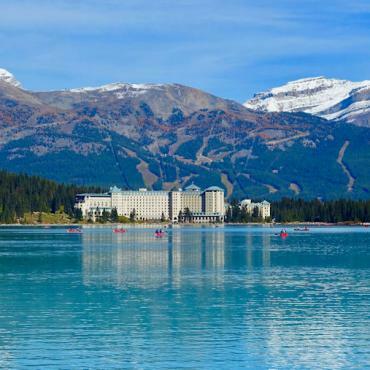 Highlights include Craigellachie, where the last spike of the Canadian Pacific Railway was driven, the climb over Rogers Pass, the Kicking Horse Canyon, the Spiral Tunnels and, the glaciers and snow-capped peaks of the Canadian Rockies. 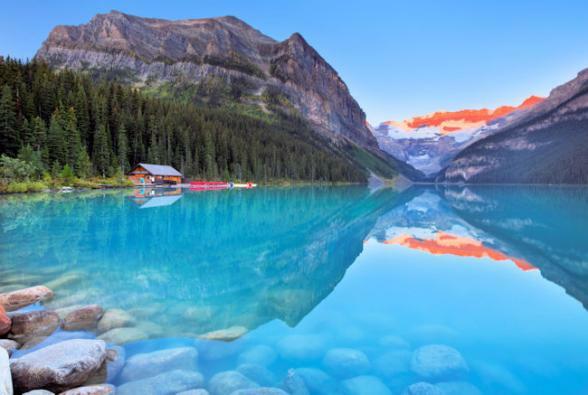 Your Rocky Mountaineer adventure rail journey comes to an end at the sparkling shores of iconic Lake Louise between 7pm-8.30pm. 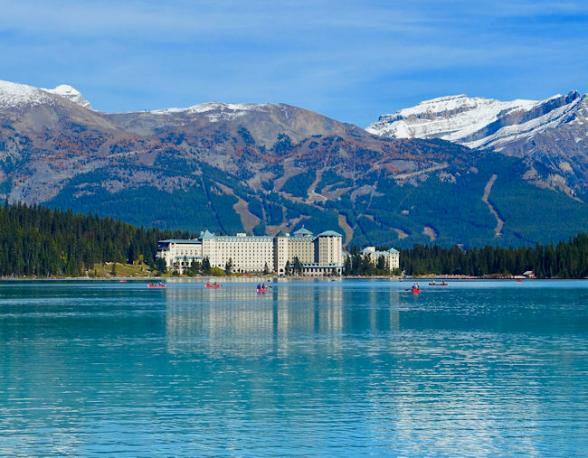 Your overnight stay is on one of the world's most celebrated hotels - the Fairmont Chateau Lake Louise. The morning is yours to enjoy at leisure. Take a stroll around the lake, scenic hike to Lake Agnes, or hire a canoe for a leisurely paddle across the lake. After lunch you'll be collected and will enjoy an afternoon tour of breathtaking Yoho National Park. Established in 1886 the history of Yoho National Park is bound up with a railroad, spiral tunnels inside mountains and stories of runaway trains, but also offers spectacular and unique natural beauty with 28 mountain peaks. 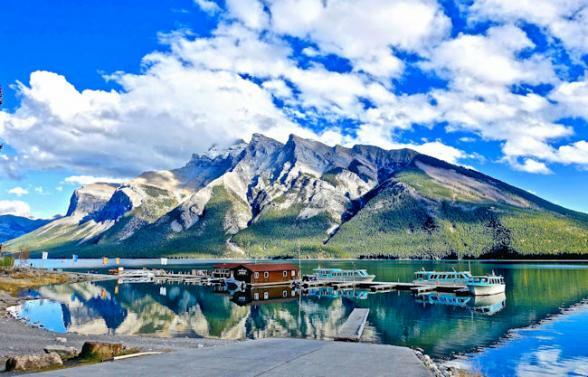 Here you'll visit the parks largest, and one of its most remarkable lakes, Emerald Lake. Renowned for its vivid colour, Emerald Lake is a place of serene beauty. 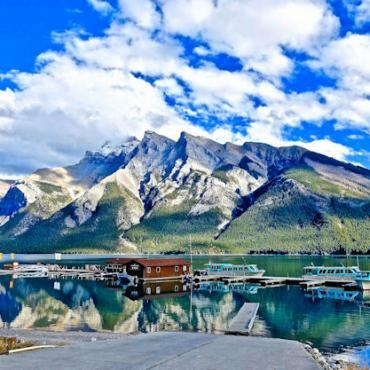 Your day begins with an escorted sightseeing tour of Banff, where you'll get to ride the Banff Gondola to the top of Sulphur Mountain. You'll witness more incredible Alberta scenery with stops at Bow Falls, Lake Minnewanka, Surprise Corner, and the Hoodoos. For a birds eye view of this region, we've also included a 12 minute panoramic helicopter flight over the remarkable landscape of the Rockies. This is a spectacular end to your unforgettable journey! Enjoy breakfast alfresco in one of the many eateries that line popular Stephen Avenue, or check out the Western stores for some last minute souveniers before your early afternoon flight back to the UK.